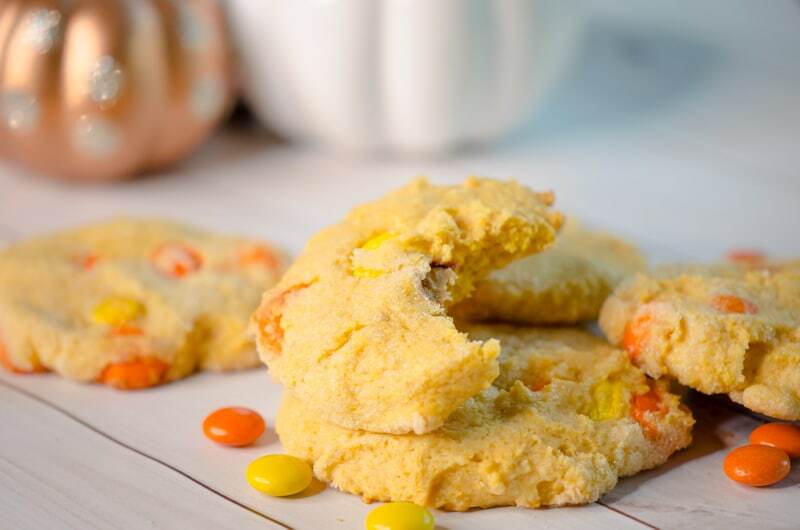 Pumpkin sugar cookies are another great pumpkin flavored recipe to add to your fall baking list. These soft pumpkin sugars are fluffy in the center but offer up a special added treat. I added REESE’S Pieces Peanut Butter Candy to really pack the flavor. 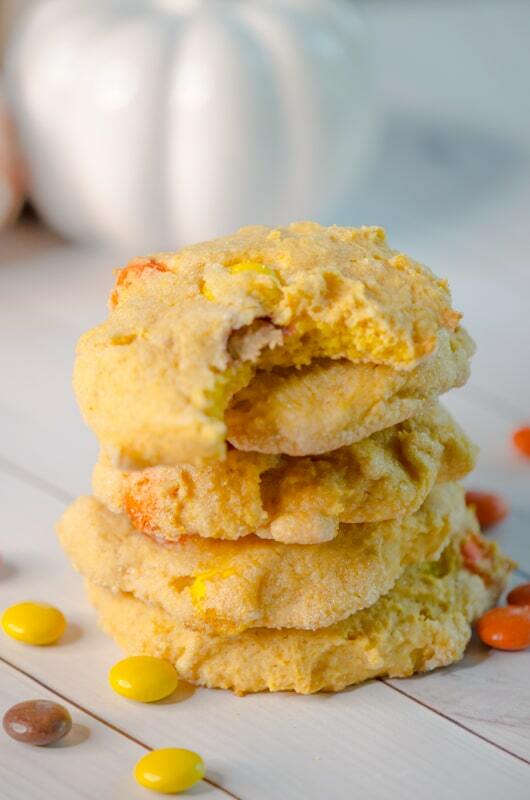 Think of this pumpkin sugar cookies recipe as a “trick-0r-treat” for the home. Sugar cookies can sometimes turn out hard, if not properly baked. However, I find that adding pumpkin tends to make a sugar cookie recipe easier to make. Plus, who doesn’t love the added pumpkin flavor during the fall? If you have leftover REESE’S Pieces Peanut Butter Candy too, this is a great way to use it. These pumpkin sugar cookies are very moist on the inside. Even with the added candy, they are melted to perfection. A sweet and savory mixture of flavors. No flavor is overpowered by the other. In a large bowl, whisk together sugar, baking powder, flour, and salt. Set aside. With a mixer on medium setting, mix together the butter and sugar until it is fluffy. Mix in egg yolk, then vanilla, and then pumpkin puree until well combined. Set mixer to low and slowly mix in the dry mixture until well combined. Scrape down the paddle and the sides of the bowl and add REESE’S Pieces. Mix on low until candy is well mixed in but careful not to break the REESE’S Pieces. Refrigerate cookie dough for 20-minutes. Roll cookie dough into 1-inch sized balls and roll into sugar. Coat well. Place on parchment lined baking sheet and press down slightly. Space the cookies about 2-inches apart. Let cookie sheet cool for about 2-minutes before transferring to a cooling rack. This soft pumpkin sugar cookies recipe creates moist fall themed cookies with a special treat inside. Create the perfect "trick-or-treat" favorite. Scrape down the paddle and the sides of the bowl and add REESE'S Pieces. Mix on low until candy is well mixed in but careful not to break the REESE'S Pieces.